Once upon a time, the nation’s complex system of railroads functioned as a super highway of sorts to transport people and products all over the U.S. While we still rely on these tracks today to move materials and passengers to and fro, we don’t need as many of them, which has led to a number of abandoned rail lines waiting to be reused, repurposed and re-imagined. The solution has been to create rail trails, a multi-purpose, public pathway made from converted rail lines. Because these lines are typically flat or have a gentle grade as they run alongside communities throughout the U.S., they are ideal for walkers, cyclists, skaters and even equestrians who take advantage of these spaces on a regular basis. Rail trails also provide municipalities with a number of benefits. 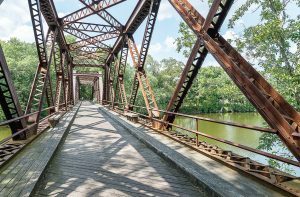 According to the Rails to Trails Conservancy, although people tend to focus on the recreational and environmental aspects of rail trails and greenways, the total package of benefits extends far beyond that. Rail trails provide communities with public health, economic and transportation benefits and they make an impact on community identity and pride. They don’t cost as much as other projects, help preserve green space and encourage new opportunity for commerce. In 1999, the city of Ogdensburg, N.Y., began creating the first portion of the Maple City Trail, which winds along the city’s northern shore of the Oswegatchie River, then extends over the Spring Street Bridge and down the southern shore of the river before looping back around. 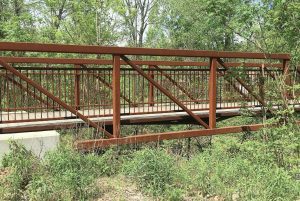 Since 2001, there has been a push to continue the trail over an old trestle bridge, but the community did not have the funds to make it happen. “We applied for several grants, but things didn’t pan out,” said Andrea Smith, AICP, planning and development with the city of Ogdensburg. In October of 2016, she applied for another grant, and this time there was good news. Last April New York Gov. Andrew Cuomo announced that the city would receive $1.6 million in order to convert the bridge and tie it into the existing trail. 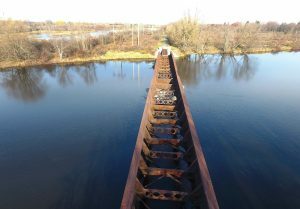 The end result will convert the bridge into a pedestrian pathway that will loop back into the city and double the length of the Maple City Trail. Smith said the rural community is also looking to create some natural exit points that will encourage trail users to stop in town for lunch and support local businesses at the same time. “Even though we are a small community, we have an international airport, and since the trail will be located directly across from it, we hope passengers coming in to catch their flight(s) or stopping through on a layover will take advantage of the trail as well,” she said. Smith said studies show that rail trails not only encourage economic growth for businesses, but also cause property values to rise and make a municipality more attractive to residents and businesses while boosting visitor traffic on an annual basis. The Enola Low Grade Trail in Pennsylvania is a more established trail that began in 2008 when the townships adjacent to the Enola Low Grade in Lancaster County came to an agreement with the leading rail lines and other entities to assume ownership of the path to create a then 8.27-mile, mixed-use rail trail. According to Providence Township Manager Vicki Eldridge, when it was first proposed, the trail got a tepid reception; however, after a change in community leadership, there was more enthusiasm for the project. The townships worked together to apply for some grants and sketched designs for it, and over time, the state showed enthusiasm for the trail as well. Today, the Enola Low Grade Trail is a 27.6-mile converted rail line that extends through both Lancaster and Chester counties. She also hopes that the trail will interconnect with other trails throughout the state, giving folks the chance to take advantage of smaller communities throughout the commonwealth of Pennsylvania. Of course, with any trail that winds through more than one township or county, it is important that the communities have similar rules regarding trail usage. There was some controversy in 2013 when portions of the Enola Low Grade Trail in Manor Township prohibited equestrians from using the trail, which caused some riders to mount their steeds in protest. 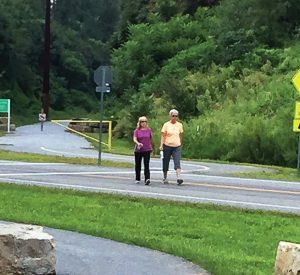 As they continue to look for ways to improve and enhance trail usage, Eldridge said they are working with businesses in the borough of Quarryville to see how they can get trail-goers off the trail and into their restaurants and shops.